Paleontologists for the first time managed to study the almost meter-long skull of a giant ichthyosaur found more than 60 years ago. Using advanced computed tomography technology, researchers have created a 3D model of the remains, including those parts of the skull that are rarely preserved in nature. The fossil, which is almost 200 million years old, was found in 1955 on the Fell Mill farm in Warwickshire and has not been officially studied before. Now, thanks to the data obtained by computed tomography (CT), the research team was able to create a digital reconstruction of the entire skull in 3D. Despite the fact that thousands of ichthyosaur remains have already been discovered in Great Britain, this specimen is particularly important and unusual, as it is preserved in three dimensions and contains rare skull bones. The research results are published in the journal PeerJ. In 2014, paleontologists Dean Lomax from the University of Manchester and Nigel Larkin first began to study the skull and a number of other bones, quickly becoming convinced of the unusualness of these remains. According to Lomax, one of the leading experts on ichthyosaurs in the world, he was extremely surprised by the excellent preservation of this specimen. Ichthyosaurs of this age are often crushed for various reasons, and the original structure of the skull is either not preserved, or distorted, or damaged. Therefore, the skull and parts of the skeleton of such an ancient ichthyosaur, preserved in three dimensions, and without any surrounding stones that hide it, have become a special find for scientists. The ichthyosaur originally found was identified as Ichthyosaurus communis, but after studying it closer, paleontologists were convinced that they had a rarer look. Based on various features of the skull, scientists identified it as a type of ichthyosaur Protoichthyosaurus prostaxalis. With a skull almost twice as long as any other Protoichthyosaurus specimen, it is the largest species currently known. “Initially, our goal was to clean and preserve the skull, restore it and re-exhibit it in the museum. However, we soon realized that the individual bones were perfectly preserved – better than in any other ichthyosaur skull known to us. In addition, this instance responded well to the CT scan, allowing us to capture its shape in digital form and see their internal details. We could not miss this opportunity, ”says study co-author Nigel Larkin. 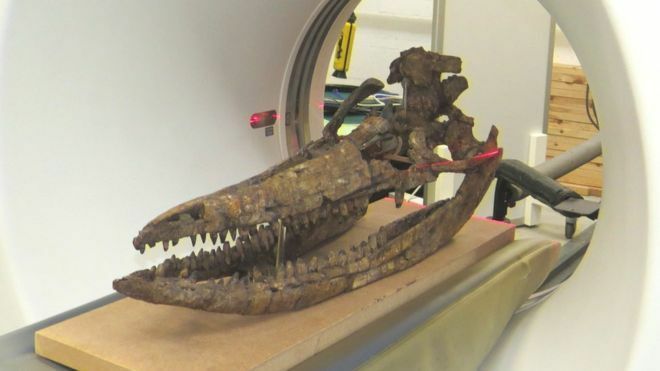 The ichthyosaur remains were microscanned at the University of Cambridge in 2015 by paleontologist Laura Porro from University College London (UCL). Despite the fact that only the bones on the left side of the brain were preserved using computed tomography, all the missing elements were formatted in digital form and printed on a 3D printer in full size. Finally, the entire skull underwent computed tomography at the Royal Veterinary College (RVC) using a scanner, usually designed for horses and other large animals. Computed tomography allowed scientists to carefully study the remains of an ancient animal – they were able to see the long canals in the bones of the skull, which initially contained blood vessels and nerves. The scan also revealed the history of the “restoration” of the sample since its discovery in the 50s. On the remains, several areas reconstructed from gypsum and clay were discovered, and one bone was so skillfully modeled that its unnatural nature was only revealed through scanning. Finally, it allowed creating a digital reconstruction of the skull in 3D. This is a rather difficult process, so it is very risky to hold it with original, fragile and very heavy fossil bones. “It took more than half a century for this ichthyosaur to be studied and described, but it was worth it. In addition to the fact that our study revealed exciting information about the internal anatomy of the animal’s skull, the results will help other paleontologists in their studies of the evolution of ichthyosaurs, ”notes Lomax. Next story Scientists have modeled a giant tsunami, after which dinosaurs became extinct.